That sparkle that your ring had when it first slid on your finger doesn’t have to disappear. Between the toughness of Diamonds and the care that we’ll put into making your custom ring, there’s no reason for it’s brilliance to fade over time. This is the most important step, mainly because of most women’s obsession with twirling their ring in their fingers. Many don’t realize they’re doing it until they drop it and get scolded by their husbands. Just in case you decide to do that above, let’s say, a sewer cap, make sure to get insurance so that you’re covered. Typically there’s more worry regarding the band itself in regards to chemicals, but the stone’s setting will never be strong enough to take a direct impact of a certain force. Losing a diamond is a real concern, so make sure to be wary of that and put the ring in a safe spot whenever you do decide to remove it. Aside from getting it professionally cleaned every 6 months or so, try to get into a routine for doing some basic cleaning. The most basic method is lukewarm water with just a dash of dish soap. Make sure its something mild and not too strong. Let the ring sit in that for a few minutes and lightly scrub afterwards. Do note that not all gems are the same, so some gemstones may not react as well to this. Also, make sure to never use bleach! There might be times where your ring needs resizing or the jeweler needs to repair it, but ideally you don’t want to alter it. Every time you make an alteration, it affects the structural integrity of the ring. Every time it’s resized there’s also the possibility of damage. It’s natural to want to resize it during a pregnancy when your hands might swell, but it’s suggested to avoid that as you’ll have to resize it back later on. Put it aside in a safe place (preferably an actual safe) for the time being or put it in your jewelry box and wait it out. 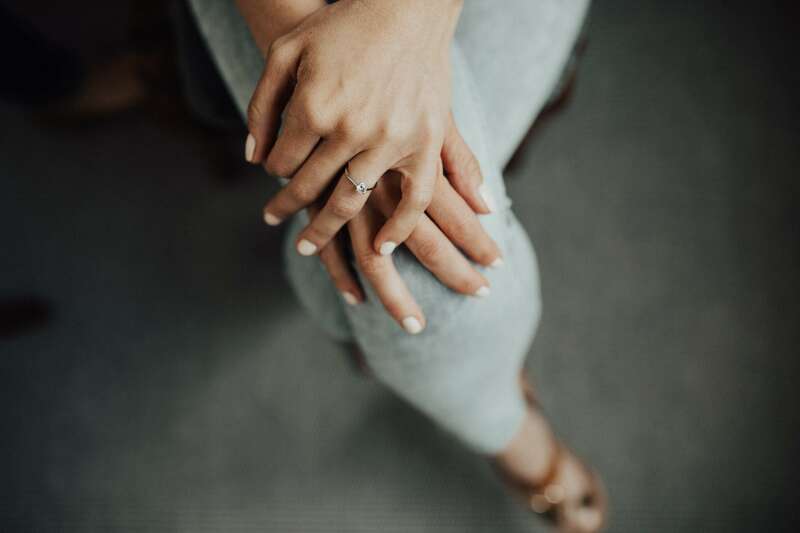 After the pregnancy, it may take some time for your fingers to go back to their original size, so don’t prematurely think that they’ve grown in size. Of course, you also want to make sure it’s done right. If you want a ring that will be gorgeous, affordable and lasting, we’d suggest looking into a custom engagement ring. Have questions or need help selecting and maintaining your ring? Contact us at our Cherry Creek location and we’ll walk through the process together.